The interest and support for Darren’s Day has been overwhelming. Thank you to everyone who has helped us promote this amazing event! As promised, here are some updates from the original Darren’s Day poster that you will want to know about! 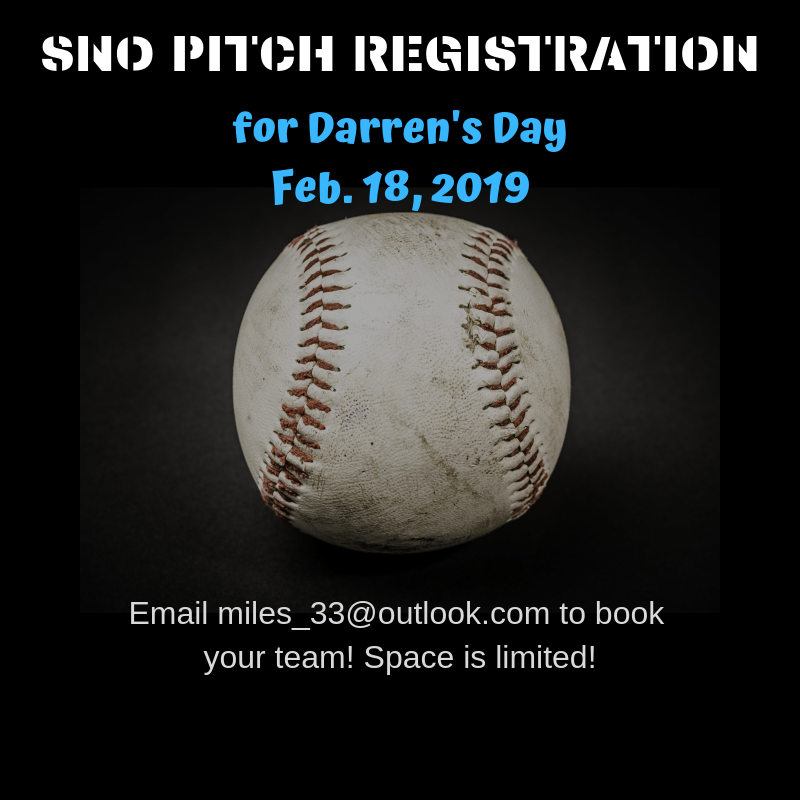 Those interested in registering a Sno Pitch Team are invited to contact Mary Iles at [email protected] The roster is filling up, so get your name in now! Registration fee is $200 per team. 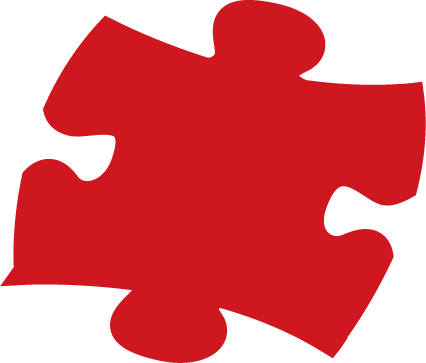 The tournament will have some fun surprises, and prizes. Bring your best costumes/uniforms and mascots. Don’t feel restrained by playing with only a ball glove – get creative! This is a “fence to fence” tournament, meaning EVERYTHING is a fair ball! On the topic of the Palmerston Marlins, the club will have a warming centre near the diamond, complete with hot chocolate, apple cider and baked treats! Thanks to Minto Fire Service, we will have fire rings to warm up by. Next, if you like your hockey, we have two options for you; mini sticks, which will be held in a dedicated area in the Palmerston Community Hall, or Shinny. Come out with the Palmerston 81s and enjoy Canada’s Game! Teams will be selected around 9:30 a.m. with games running from 9 a.m. to noon. It is preferred that participants wear full equipment, and all players should bring a light and a dark jersey. Darren’s Day promises to be a great day for family and community. 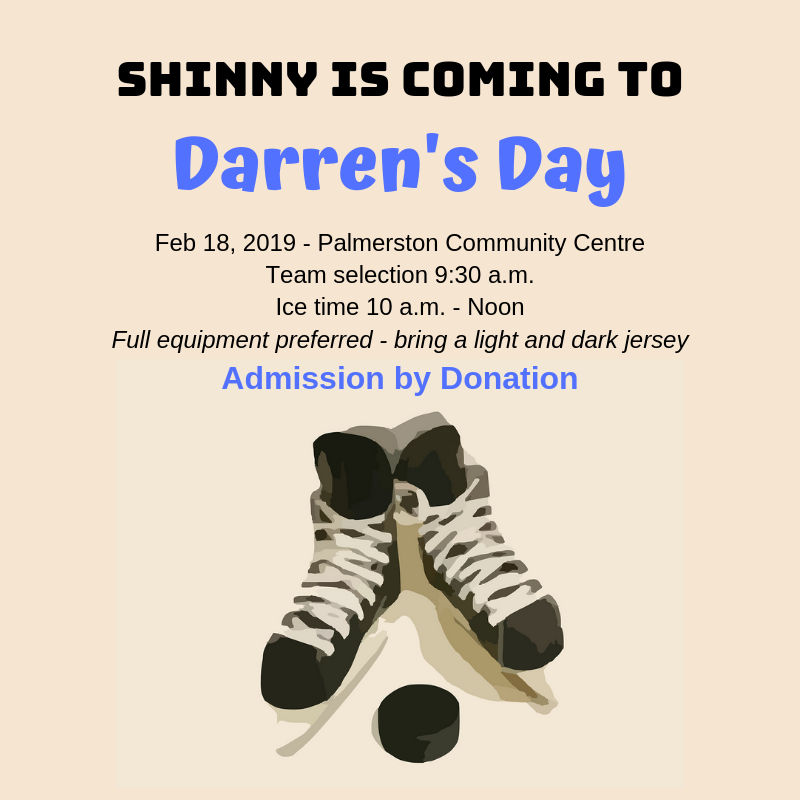 Mark Feb. 18 “Family Day” on your calendar and join us to celebrate Darren More at the Palmerston Community Centre with the Palmerston Marlins, Palmerston Lions, Town of Minto, Wellington County OPP, Minto Fire Service and Crime Stoppers Guelph Wellington. Make it a day from 8 a.m. to 2 p.m. or pop in for your favorite activity. Admission and food is by donation. All proceeds from Darren’s Day will go to Minto Minor Sports, Community Improvement and Crime Stoppers Guelph Wellington. If you have any questions about Darren’s Day, “Contact Us”.